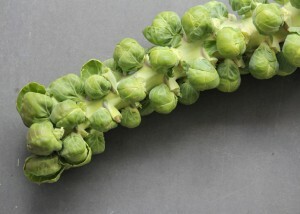 Storage: Do not wash or trim Brussels sprouts until you are ready to use them. Sprouts purchased on the stem can be kept on the stem in the refrigerator if you have room. If not, remove them with a sharp knife and store loose sprouts in a perforated plastic bag in the crisper drawer of the refrigerator (discard the stem). Fresh sprouts will keep for several days. Preparation: Trim any bruised or yellowed leaves if necessary as well as the stem end, being careful not to trim away too much so the outer leaves don't fall off during cooking. Cut an X in the base of each sprout so the interior cooks as quickly as the outer leaves. Regardless of cooking method, test for doneness by inserting the tip of a knife into the stem end, which should be barely tender. Overcooking enhances an unappealing cabbage-like odor. Taste: Cabbage-like, but a tad sweeter. Nutritional Benefits: Brussels sprouts provide vitamins C (for immunity) and A (for eye health), folic acid (for cell maintenance and growth), potassium (for heart and kidney health), fiber and protein.